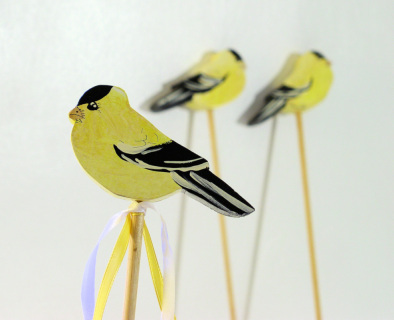 Yellow Goldfinch plant marker is ready to decorate the garden or a potted plant on the porch or deck. You can even use them as table markers for an outdoors wedding or summertime party. 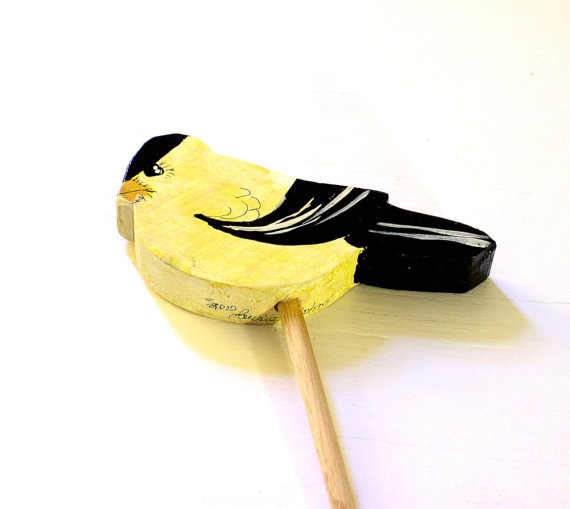 The birds are cut from a pine board and I use a wood dowel as the stake. I cut out each one and paint each bird by hand so no two will be alike. Every bird is varnished. I have three available. Birdie comes with raffia. I tie a bit of raffia or a ribbon with a message can also be added. This is for one bird only and if you would like more please let me know. Ask about shipping charges outside the 48 states. I ship everywhere please before you order ask for international shipping actual charge to your location. The price for shipping everywhere is only an estimate. The birds are shipped with dowels seperately. Just insert the dowel into the bottom.